I have a two-fold purpose in placing this material on my website. First, it is an exciting phase of Maine history which should not be forgotten and it is my desire to help keep it alive. Secondly, I have a very personal reason for doing so because it was primarily my ancestors who were responsible for this undertaking and I do not believe they were given the proper credit for it as I shall attempt to prove by my comments which will accompany the historical account reproduced herein from the centennial material for which I am indebted to Ancestry.com. It is therefore in the interest of accuracy that I publish this material as I may be the only one in posession of the facts who is concerned and I consider it my duty to make them known. Facts are one thing, hearsay is quite another and we all realize that much of what we read of these accounts comes from word of mouth, but I believe that there is enough factual evidence to be had making it quite convincing to the average skeptic who will take the time to read and digest it. Thank you for doing so. I will interject material at this point from the Libby Family in America, 1602 - 1881, by Charles Libby which disagrees with the account above. Note at the bottom of p. 10 above that it was generally known that marsh grass could be found east of the Penobscot. According to the story told to my great grandfather Henry Allen Libby by his grandfather how his father Timothy Libby was the one who discovered the resources in the Machias area and who put together the party of settlers from Scarborough. This would have to be an outright lie if it is not the way it happened. 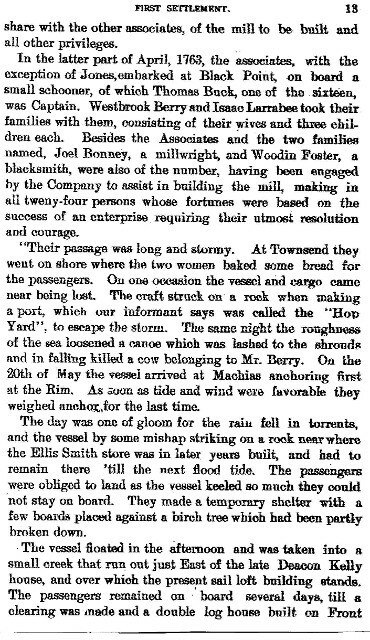 The whale boat story may be made to fit into the picture perhaps, but otherwise it seems to be conjecture and hearsay. Again, the facts concerning the makeup of the Scarborough party bear out my contention that it was a Libby enterprise from start to finish. (Incidently, the two men that are mentioned in the Whaleboat exploration party were intermarried with the Libby family in Scarborough and Isaac Larrabee was one of my direct ancestors, born in 1729, a fourth great grandfather, whose son Joseph was married to Rebecca Libby who may be traced back to Josiah Libby, the brother of Timothy, the hero of our story, but "unknown" according to the above account! Once it is seen how the Libby family was involved It will demonstrate how uninformed the so called informers were who gave Mr. Smith his information on this story. At least the towns people remembered when they named their town hall, "Libby Hall" for George Libby, Timothy's brother, who donated the land upon which it was built. 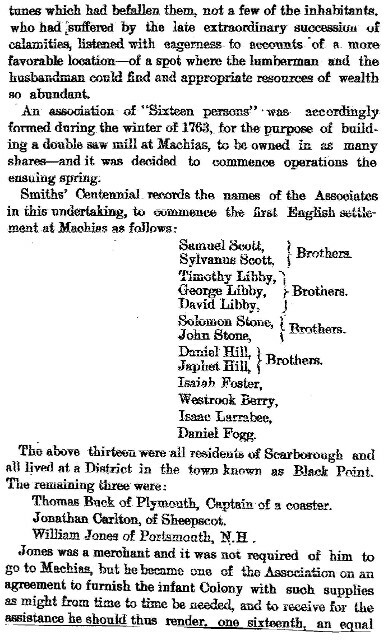 It should be noted that all of the party made up those who sailed to Machias were from Blackpoint in Scarborough, Maine. This is the area know known as Prout's Neck. It was once called by the inhabitants, Libby's Neck and it was where the immigrant, my seventh great grandfather John Libby built his house in the early 1600s. He had come as a fisherman to Richmond's Island working in the employ of Trelawny in England. He had 12 children, most of them born in Scarborough. I, Charles Mason am decended through his 10th child, David. Four of his grandchildren were in the original 16 mentioned here on page 12. One of these is a grandaughter and was married to Solomon Stone. The father, David, of these three brothers was one of those settlers of Scarborough who was driven off by the indians in 1690. He went first to Portsmouth and then in partnership with his brother Matthew, his brother in law Daniel Fogg and one other, he purchased land in Elliot, Maine on the Piscataqua River within sight of the New Bridge in Kittery Maine. In 1727 Captain Fogg moved to Scarborough where he settled on Libby River opposite the original Libby homestead. It was his son Daniel (2nd) who is listed with "the sixteen". He was married to Sarah Scott whose father is the Samuel Scott also listed as one of "the sixteen". Are you beginning to get the picture? So far I can find nothing about Carleton - tell me if you know anything about him. We read that the women and children of all the other married men were sent for - and who did the arranging for that? Not surprisingly, a Libby. And no wonder, For Timothy, our hero had 7 children under the age of 20 and one was born the year of the move 1763. Unfortunately, by 1766 he died leaving his wife Sarah (Stone) Libby in a tiny cabin in the wilderness to care for this tribe. It was well that she was surrounded by family which I think I have proved that she was! If, however, I have not offered proof enough, let me go on to mention the fact that many more of those who came later, some of whom were listed among the eighty petitiioners who sued for legal status and recognition from the General Court in Massachusetts, were either Libbys or intermarried with them. There were eleven Libbys on that list which was more than one eighth of the total. We have already seen that a dozen or more of the others were related to them. If we tried to tie the rest in we could probably succeed with most of them. Let me mentiion one important Libby name that for some reason is not on the aforementioned list yet a very important settler. His name was Josiah Libby Timothy's brother. It is stated in the Libby Genealogy that he probably came among the early settlers in 1763. If he did, his name did not get on the memorial stone. He probably came a bit later but certainly not much later. Josiah Libby, like his brother, brought 7 children to the new settlement. His two eldet sons were on the list of petitioners which I will post near the end of this article. These two Libbys plus Joseph Libby, Josiah's son had among them 23 children who all survived to adulthood and married in the area. That's from three of 14 who were living there by 1770. I say, that's a lot of Libbys and they didn't even come in for honorable mention in Smith's account of the founding of the town. Another important person that has not been mentioned yet but comes up on page 15 is Deacon Joseph Libby. (to be distinguished from the Joseph named above). He didn't add much to the population, but he certainly was one of the leading inhabitants. " He and his wife were both original members of the first church and was chosen the first deacon. He was continually called upon to perform funeral services, and in that capacity and many other kindnesses to which his earnest Christian spirit prompted him. he won the love of all about him." (Libby Book} He adopted a son, Francis (Getchell) to whom he left his homestead. Francis married Sally Burnham, daughter of the proprietors of the Tavern, which brings up onother Josiah Libby who at 17 took part in the capture of the Margaretta and is said to have fired the first shot. Didn't everybody, but I copied this out of the Vital Records of Machias, p.148. 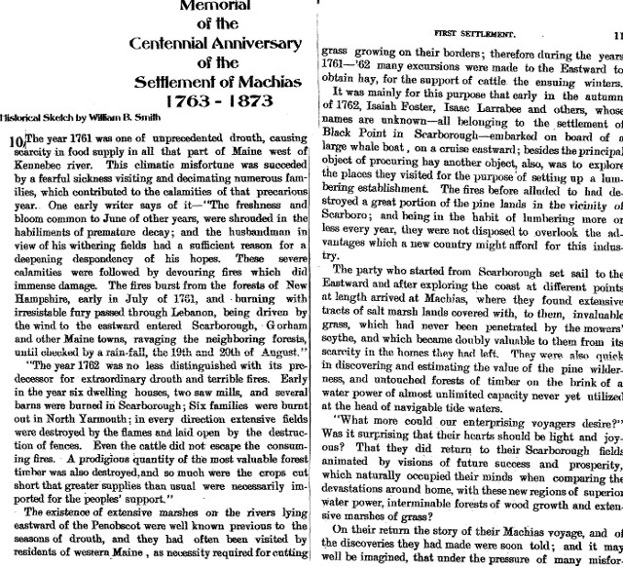 Below is a copy of the petition from Smith's History of Machias which was submitted in 1770. It was accomplished through the efforts of Abial Sprague, my 4th great grandfather, and it does not take much imagination to note how many Libbys were included. Considering also that a great number of the others were intermarried with the Libby family or otherwise involved with them, it is obvious that they were much more prominent as a founding family than they are given credit for in the historical account. (Most computers have the capability or enlarging the type which you may need to do in order to read the petition). P.S. The Sprague Family in Machias. The Sprague family did not properly fit into my argument as presented above because they did not live in Scarborough nor any where else in Maine at the time, and , to my knowledge, they were not intermarried with the Libbys, however, they were introduced to both at about the same time that Machias was founded and history will show, they became very much involved. 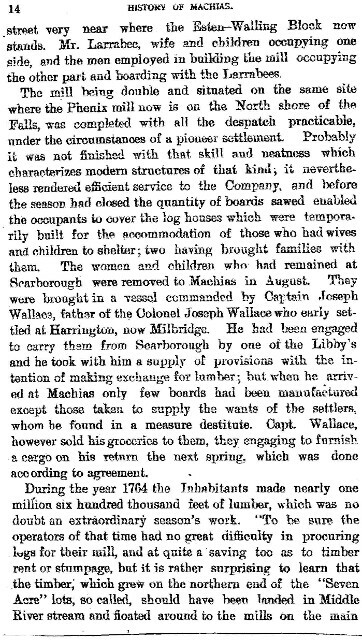 My reason for bringing them into the story is because their appearance in Machias is very important to me since my maternal grandmother was a Sprague and she was married to a Libby. George M. Libby married Emma Sprague in 1888, they had 7 children, one of which was my mother, Doris Libby, and they lived all their lives in Lubec where I was born. First, let us deal with how the Spragues came to be in Maine. Again, to the extent of my knowledge at this point The entrance of this family into the district of Maine occured in the person of a man we will call Abiel Sprague. His name has a variety of spellings, however. According to the Sprague genealogy, he was decended from Samuel Sprague who was married to Ruth Alden, the grandaughter of theJohn Alden and Priscilla Mullen of Mayflower fame. 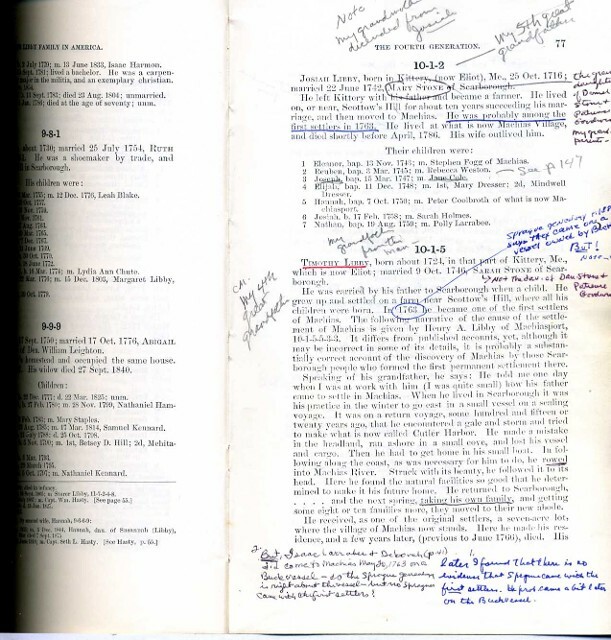 For reasons that we will not go into here, this relationship is contested by the Mayflower Society which must have primary sources of which family genealogies are not considered one. The fact is that Abiel is listed in both the Sprague and Alden books and other facts support this family tie. In any case, the fact that Abiel existed as a Sprague and came to Maine is incontestable as many legal documents will testify. His father Samuel moved from Duxbury to Rochester about 1710 and the vital records show the last three of his children as going with him. The marriage records of Rochester show Abiel's marriage to Elizabeth Ashley, the mother of his first four children, possibly all five. Ashley died about the time of the birth of the fifth child and he married Hannah Getchell (Smith)in June 1744 according to the Vital Records of Yarmouth, Maine. In 1759 he and his wife Hannah sold for 72 pounds a certain island in Harpswell, commonly called Great Sebascodegan Island where he had lived for more than 20 years past (Cumberland Co Me, Deeds). The next statement in the Sprague Gen. states that in 1763, May. He sailed with other settlers to Machias on Capt. Buck's vessel. In dealing with this last statement we recognize that there is an error somewhere. It is certainly strange that he is mentioned as coming to Machias at that time and by that means, but come, he did! 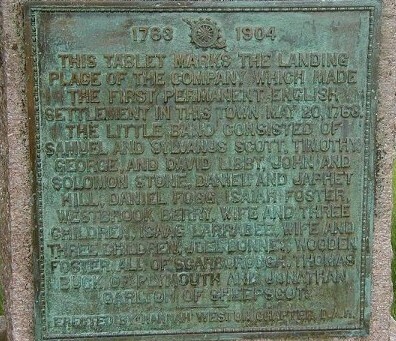 It is certainly a very interesting fact that the vessel that carried the 16 settlers mentioned on the founders plaque was owned by a Buck from Plymouth, MA. How he got tangled up with the Libbys in Scarborough would also be most interesting. 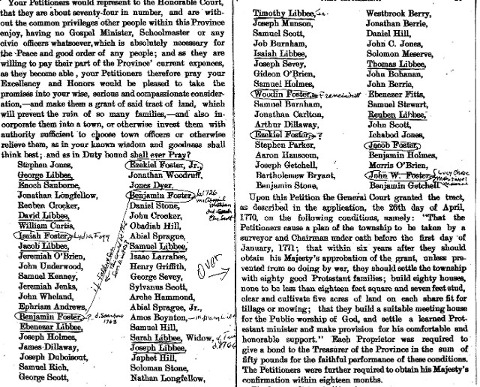 The Sprague Gen. P.189 shows that Abiel's first three children all married Scarborough people between 1756 and 1766 according to the records of the second Congregational Church in that place. 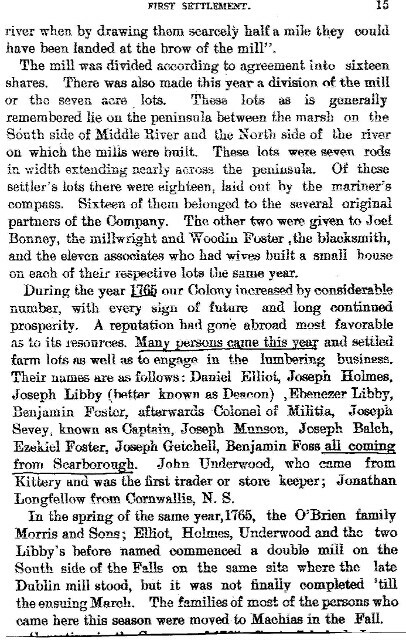 One of them, Abiel II married Martha Bryant on Oct. 2, 1766 The last two children, Elizabeth and James were married after the move to Machias It is stated that Wooden Foster was enlisted by the Libbys because he was a blacksmith and they needed him to help build a sawmill. It is also stated that Joel Bonney was likewise enlisted because he was a Millwright. Now, Sprague was a Cordwainer by trade and Bonney later married Abiel's daughter Elizabeth. Did these people all know each other??? before moving to Machias? Were they all enlisted by Timothy Libby - I say, probably. Anyway, it makes a good story! But that is the way the first Sprague in Maine got to Machias who, incidently, was my 4th great grandfather. Both Abiels (father and son) are on the proprietors list above and the names Abiel and James (probably the brothers) are on the list of those who were listed on page 48 of the Smith centennial as those involved in the capture of the Margaretta in 1775. Abiel, James and Moses Sprague along with Joel Bonney attempted to set up a lumbering operation on Grand Manan Island in N.B. Canada but ran into opposition by the Indians. They agreed to leave but stayed the winter during which a son was born to Bonney, the first white child to be born on the Island and who later became a Baptist minister. In the spring of 1780 they moved to the St Stephen area where they were involved in a lumbering operation in Digedquash with some 42 others. Bonney was an ardent loyalist. James and Abiel moved to the Calais area where they were among the original 8 families listed in the 1790 Census. Abial moved north to Bailyville and James moved down to the Red Beach area. Most of the settlers of Calais came from Machias drawn by the valuable timber lands and convenient water power. James was drowned in the St Croix, then known as the Schoodic River, while crossing to St. Andrews. James' son James married Priscilla Noble and they were the parents of Daniel Noble Sprague who married Mary Hannah Larrabee. 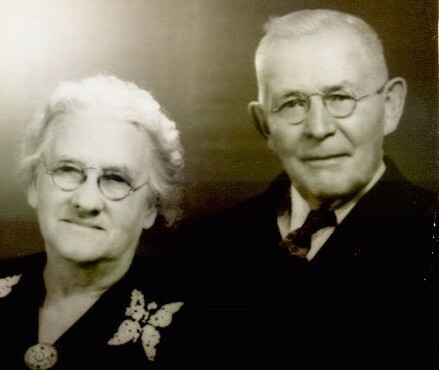 These two were my great grandparents and the parents of my grandmother Emma Sprague who married George M. Libby. And that is the story of how the Libbys and the Spragues got together They lived in Machiasport, the Spragues on the west side and the Libbys on the East side and they courted back and forth by rowboat. There used to be a Baptist church on the East side and back of the site is the cemetery where many of these relatives are buried. 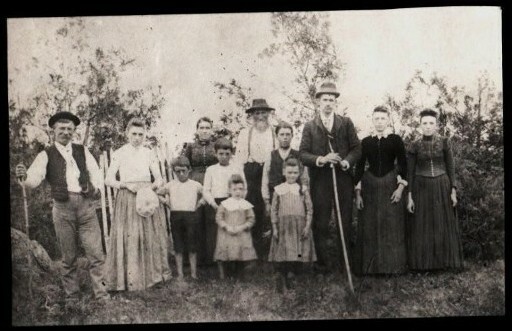 The picture above is my grandmother's family, the Spragues. Her father and mother are in the center in the back row and the others are all their children except the man on the left who is my grandfather George Libby and the tall man with the long stick who is my great uncle Ed Ramesdell. My grandmother is the lady on the left with the white blouse. The picture below is of my grandparents George and Emma Libby on their 50th wedding anniversary.